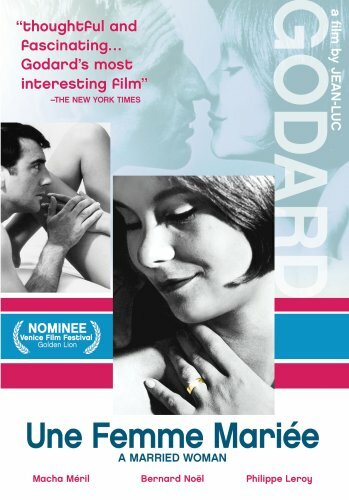 At the risk of completely obliterating my credibility to any and all readers, I�ll admit it: I�d never seen a Jean-Luc Godard film before sitting down late in the weekend to watch this. There�s no reason why I never sought the director�s work other than it�s expansive and intimidating. You can look at his resume for hours and have no idea where to begin. Thankfully, I have an editor who isn�t afraid to make these tough decisions for me so, unsure of what to expect, I took Une Femme Mari�e for a spin, thinking I was simply getting a story about the trials and tribulations of a bored housewife. Charlotte is a beautiful middle-class woman married to a successful pilot while having an affair with a handsome young actor. She�s ready to abandon her husband in favor of the passionate young man until a surprise pregnancy obscures the seemingly easy decision. Now she�s forced to consider both men carefully, but it�s not a conclusion that comes easily. Godard isn�t interested in the convoluted trappings of a woman�s choice, nor does he feel any obligation to paint his characters in a positive light. For all intents, Charlotte is our protagonist, but only in the most traditional sense. There�s nothing particularly likable about her (even less so about her lovers) and her depth is relegated to whatever advertisement or periodical she�s last noted. In fact, this is less a story about a cheating woman and more a commentary on the shallow nature of consumer culture (this was a problem even in the early 1960s?) told through the eyes of a fickle housewife. Charlotte doesn�t seem to have the faintest idea of what she�s looking for. Her thoughts are taken directly from media adverts, many of which are of a contradicting nature. What�s worse is that she�s seen as less of a person and more of an object in the eyes of her men. Her husband treats her like an extension of his property while her lover can�t be bothered unless it�s to objectify her naked body. Godard shoots their scenes in a series of lingering close-ups that exploit Charlotte, emphasizing that she�s as much of an object no matter which man she chooses. Une Femme Mari�e surprises with its scathing indictment of media power. Maybe my unfamiliarity with the director is the reason why, but I found myself entranced and appreciative of its ultimate purpose. It�s not a flattering examination of societal femininity, nor does it aim to be. Instead it holds a mirror up to a society more concerned with status and instant gratification than love and affection. My, how things have changed since then. Koch Lorber presents Une Femme Mari�e in a nice looking transfer offering strong blacks to contrast with the stark whites. This being a black and while film, the contrast is solid if not amazing, with satisfying image quality that occasionally falters with a soft look. Still, I was very pleased with Koch Lorber�s presentation. Not much to say here. Dialogue is clear, never overshadowed or drowned out by the music or sound. It�s a mono track, a perfectly adequate one.